TWU doesn't have any of these books yet. The following links are from various sites that support the Caldecott Medal. Caldecott Award Books -- This website created by retired Texas educator, Suzy Red, contains several resources and ideas for using Caldecott Award books. 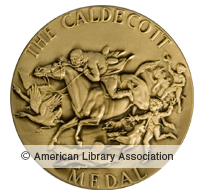 Take the Caldecott Medal Quiz! Newbery and Caldecott awards a guide to the medal and honor books by Association for Library Service to Children. ; NetLibrary, Inc.